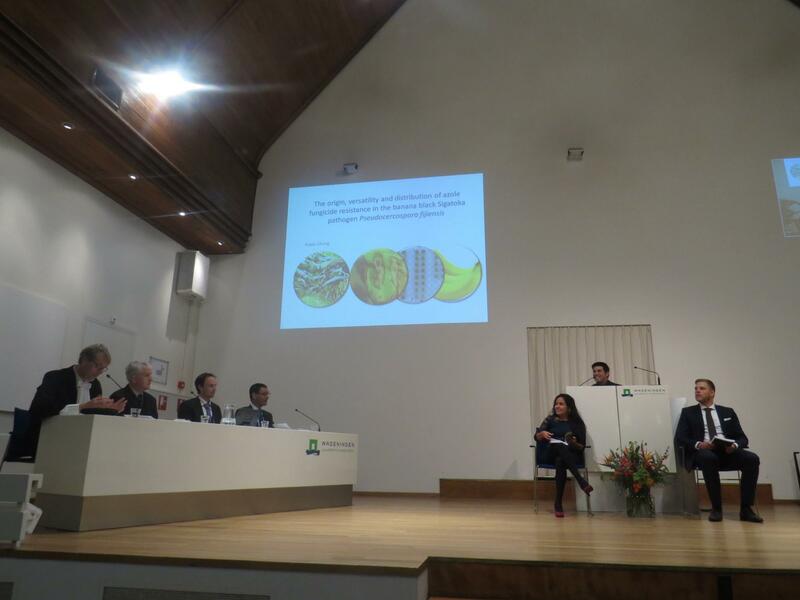 On Monday 31 October 2016 Pablo Chong Aguirre, originating from Ecuador, successfully defended his PhD thesis on “The origin, versatility and distribution of azole fungicide resistance in the banana black Sigatoka pathogen Pseudocercospora fijiensis”. 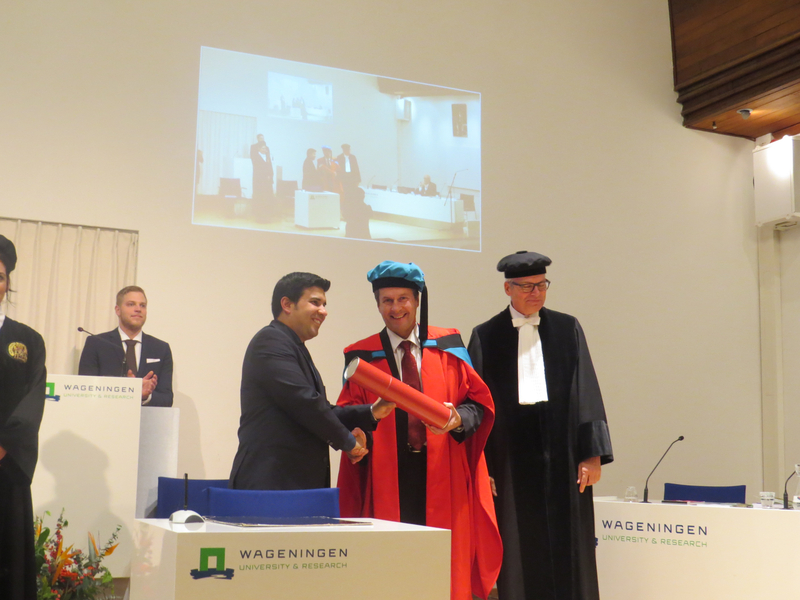 Professors Pedro Crous and Gert Kema, Pablo’s supervisors, proudly presented the diploma to Pablo. The research papers from Pablo’s thesis are foreseen for 2017. Pseudocercospora fijiensis causes black Sigatoka disease of banana. It is one of the most damaging threats of the crop requiring excessive fungicide applications for disease control as the major export “Cavendish” clones are highly susceptible. The consequence of this practice is the reduced efficacy of disease management strategies due to increasing levels of fungicide resistance. 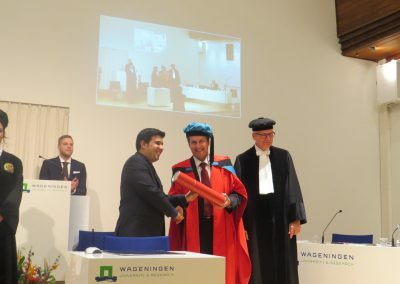 In this thesis the history and current practices of black Sigatoka disease management as well as the underlying mechanisms of fungicide resistance to a major group of fungicides are described. We discovered that both target site mutations and promotor insertions are crucial for modulating sensitivity. The more insertions, the higher the expression of the gene and the more resistant the strain. 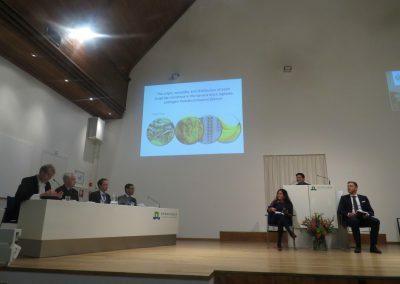 Using this information, we advocate modern monitoring techniques and improved disease control strategies as well as the urgent need for innovative banana breeding to develop resistant varieties for a sustainable global banana production.